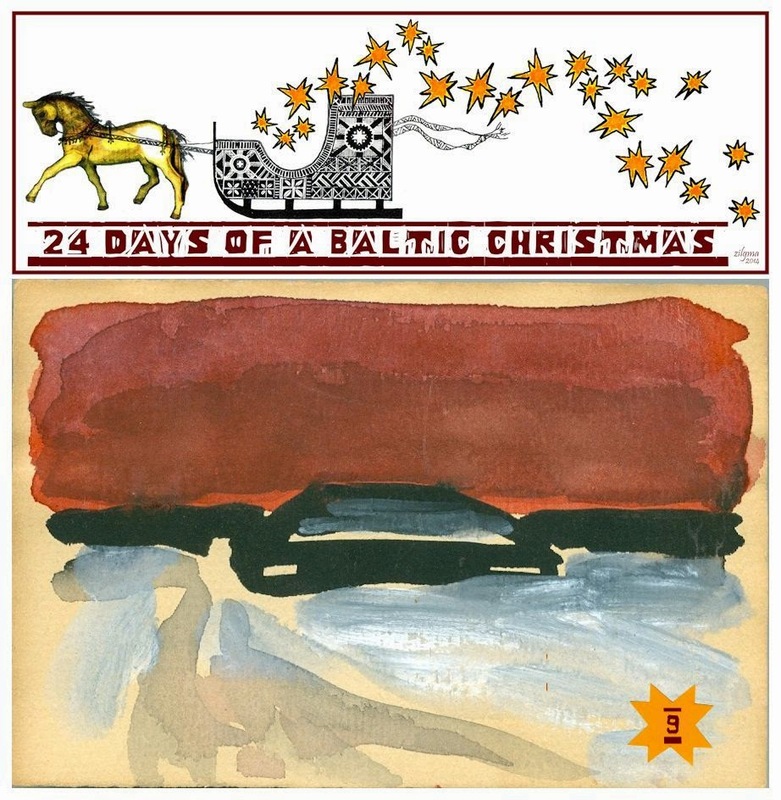 Day Nine of 24 Days of a Baltic Christmas is by Daina of Latvian-American Adventures and Opinions. The very first Christmas cards were sent in London in the 1840s, and today it is still a popular holiday tradition in many countries. Latvian-Americans send Christmas cards with gusto because we often live far from friends and family, and see one another infrequently. While the custom of everyday letter writing has all but disappeared, it seems that Christmas cards have not yet become a victim of modern technology – other than the fact that in the United States far more cards with personal photos on them are being created and mailed. Latvians around the world are fond of writing poems or parts of folk songs whenever they pen greeting cards. Indeed, when I began googling Ziemassvētk…, the Google auto-complete feature helpfully suggested pantiņi or dzejoļi (poems) or apsveikumi (greetings) as search options. In Latvia pocket-sized books containing various poems and greetings are published. One such book, “Dzīve, mana dzīve,” has ten pages of Christmas and New Year’s poems. 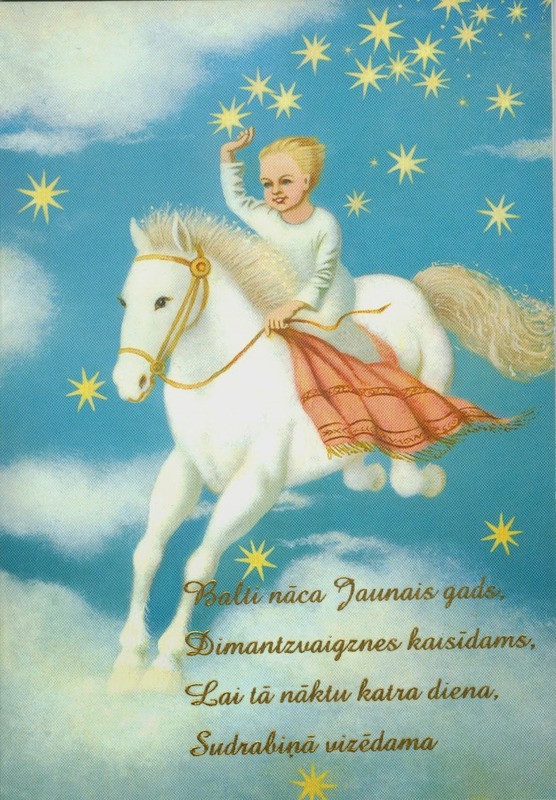 During Latvia’s Soviet occupation organized religion and religious holidays were outlawed, which meant that Latvians living under Communism celebrated New Year’s instead, and sent appropriate greeting without religious connotations. 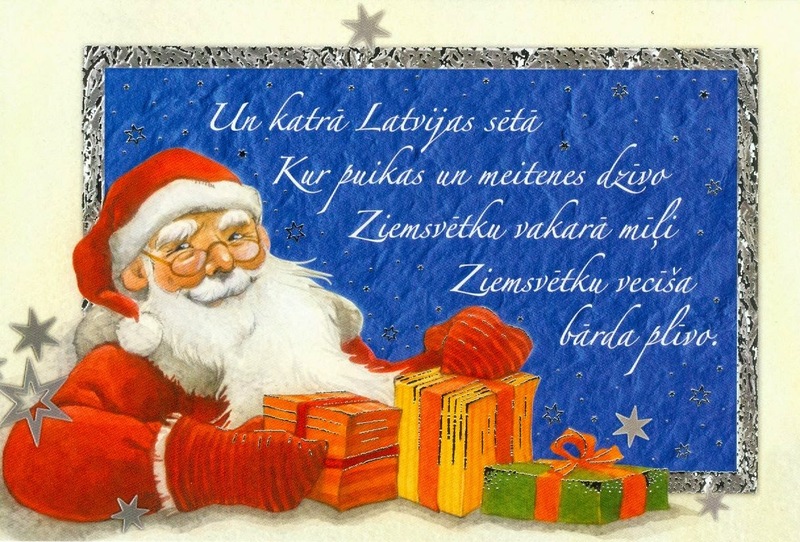 Many residents of Latvia have continued this custom, and cards received from friends and relatives there often still reference the New Year but not Christmas. If one is friends with a Latvian artist, then at Christmas one might be lucky enough to receive a handmade card. Well-known Latvian-American artist Jānis Kalmīte included miniature watercolor paintings in his Christmas greetings. Best known for his large oil paint depictions of the threshing barn (rija in Latvian), Kalmīte’s holiday gifts were typically a small painting of this farm building in winter. 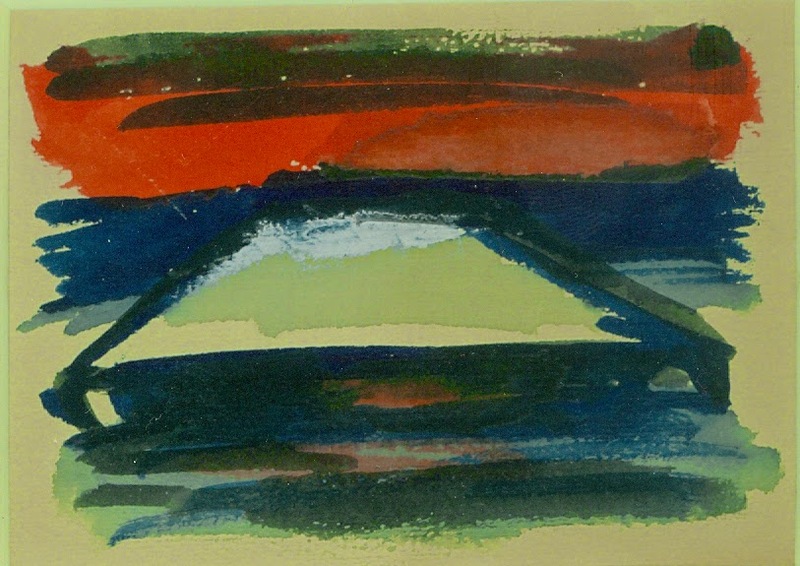 My parents received several such small paintings from Kalmīte in the 1970s and 1980s. Sending Christmas greetings is a tradition which helps connect people to one another and often even to their heritage, thus let us hope that this custom is one which continues. Paldies Daina! A topic wholly suited to your name! (Dainas are a traditional form of Latvian music or poetry, and as explained above are often utilized in greeting cards.) You can catch Daina on twitter @mana_dziesma, and please join us tomorrow for a traditional Lithuanian family Christmas on Day 10 of 24 Days of a Baltic Christmas! Our family also sent homemade Christmas cards - not quite on the artistic level of Kalmīte, but each one-of-a-kind nonetheless. When we were younger, construction paper cut-and-paste was the medium, and winter hills, fir trees, colorful presents were the themes. Later we graduated to linoleum block printing, then silkscreening. I think we all felt proud when our parents chose to use our hand-made cards over purchased ones year after year. The tradition has continued with my own family - we LOVE getting handmade cards for any occasion from our grandchildren (the ones in this blog are extremely talented)! As for us, it seems that if handmade cards don't get made, then cards do not get sent that winter.... (and there have been quite a few of those recently, sadly). Good intentions - here's hoping someone receives a card from us this Christmas! Handmade cards are few and far between nowadays. It seems that 95% of photos I receive from friends who have kids nowadays are photo cards. I think it is true about home made Christmas cards, but in general in Latvia card sending is not any more very popular. I can compare with England where you need to give a card for sure, but in Latvia it is not any more. Last 15 years for sure I didn't get or sent out an card to my relatives in Latvia. Of course, it is different now as we are abroad, but not inside in Latvia. I guess it doesn't surprise me. Why send a card if you can Skype or Facetime? In the US the vast majority of cards that families with children send are photo cards ordered online, Little labor involved - no more writing actual greetings. Just pick out a photo or three, create the card, order several dozen, quickly write addresses and slap a stamp on each - all done. But I like even receiving the photo cards. :) Who doesn't like receiving snail mail?! ?